Benjamin Netanyahu is set to serve a fifth term as Israel’s prime minister after his main rival conceded that he had lost the election. 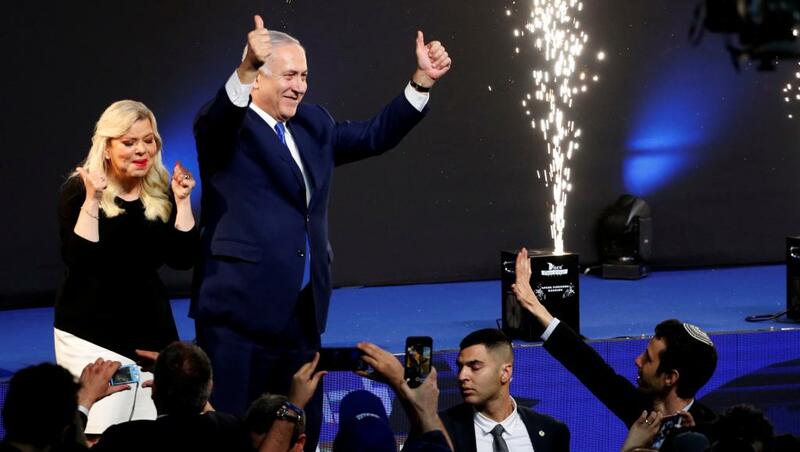 With 97% of votes counted, Netanyahu’s Likud party and the Blue and White party, led by former army general, Benny Gantz, had tied with 35 seats each in the 120-seat house, the Knesset. However, the rightwing bloc that Netanyahu is part of had 65 in total, a comfortable majority. Despite three impending corruption indictments, the prime minister emerged as the winner from a tight election race to continue his 10-year stretch in high office. Netanyahu has already begun to broker deals with religious and far-right parties to form Israel’s next government. The 69-year-old former commando, who first became prime minister in 1996, is on track to become Israel’s longest-ever serving leader this summer. “This is a night of tremendous victory. Tremendous,” he said even before early poll counts had been released. “Tonight, I already began talks with the leaders of the rightwing parties, our natural partners.” Several world leaders, especially nationalists, rushed to congratulate Netanyahu. ﻿Netanyahu tweeted on Wednesday that Trump had called him to congratulate him on his re-election for a fifth term. “The two leaders agreed to continue working in the coming years in the closest way for Israel and the United States,” Netanyahu said in the statement on his Twitter account. Trump also tweeted a photo of the Trump flag at Bibi’s election party: “The fact that Bibi won, I think we’ll see some pretty good action in terms of peace,” said Trump, who has tasked his son-in-law, Jared Kushner, with drafting a Middle East peace plan. Palestinians have preemptively rejected it, citing overt Trump bias, while Netanyahu has shown open disdain for peace efforts. India’s Narendra Modi tweeted to his “dear friend”, and said he hoped to “take our bilateral partnership to new heights”. On the campaign trail, Gantz had sought to capitalise on the corruption allegations, presenting himself a clean, centrist alternative to Netanyahu. But by daybreak on Wednesday, the results showed the plan had backfired somewhat as Israelis saw the election as a referendum on “King Bibi”. Although they tied, the Likud party performed better than ever,, possibly buoyed by its election campaign warnings that the right wing was in danger of falling to “leftists” and Arab parties. By presenting the election as a binary choice between the two main candidates, leftwing parties were decimated, leaving Gantz with few potential coalition partners. And while Netanyahu will have to offer concessions – such as ministerial posts – to rightwing parties to back him, the religious factions he already has agreements with gained seats. Meanwhile, some of his more demanding ultranationalist allies lost their bargaining power. Unofficial results showed former education minister, Naftali Bennett, a political partner of necessity rather than choice, may not make it back into the Knesset. Solidifying Israel’s drift towards the right, a Netanyahu fifth term is expected to entrench the occupation over more than 2.5 million Palestinians in the West Bank and the severe blockade on 2 million more in Gaza. A far-right alliance is expected to be in government, although its candidate from Jewish Power – whose members have called for the expulsion of Arabs and have been internationally condemned – did not make it into the Knesset. Hanging over Netanyahu’s victory are the indictment recommendations, allegations he dismisses as a “witch-hunt”. Now the election is over, Israel’s attorney general, Avichai Mandelblit, is freed of the political pressure not to influence the vote with potentially damning, but unproved, case details. Therefore, the process of the indictments is expected to gather pace and a pre-trial hearing in which Netanyahu can defend himself will start.